Providing community alarm services for the residents of Buntingford and the whole of Hertfordshire. Hertfordshire Careline supplies community pendant alarms for the people of Buntingford and across the whole of Hertfordshire. 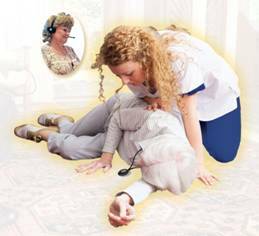 Hertfordshire Careline’s community alarm service provides around the clock help, reassurance, and support for those in Hertfordshire who want to stay independent in their homes. We have been providing independent living services across the county for over 30 years and are one of the largest independent providers of assistive technology in the UK. who you are, your medical history and will be able to talk to you via the speaker built into the alarm unit. Once we have knowledge of the problem we will either contact your designated responder (family member or friend), doctor, carer or the emergency services if necessary. We also have a Fallback Response Service that will attend your house if we receive a call from your alarm unit but cannot get a vocal response back from you, or if we cannot get in touch with one of your responders. The Fallback Response Service provides re-assurance, that where we are unable to ascertain the nature of an emergency and no designated responder can attend, then a Fallback Response Officer will visit you to check on your wellbeing and advise the Careline operator of the circumstances.